﻿Johannes Vermeer was a Baroque painter in the 1600’s from the Netherlands. Most of Vermeer’s paintings were of ordinary indoor scenes from his hometown of Delft where he spent his entire life. Our painting of the week is The Art of Painting. This was Vermeer’s largest (47 X 39 in.) and most complex work, yet it has the characteristics of most of his typical paintings: a 17th century Dutch interior lit by a soft light, exquisite details, and the characters in a frozen moment. This painting must have been special to Vermeer, because he never sold it even though he got in serious debt in later years. Paint in Vermeer’s day, wasn’t available in metal tubes. Artists had to buy colored pigment as a powder and mix it with oil. Vermeer, as many painters of his time, used a very limited palette. A palette is the set of colors that an artist paints with. An artist in the 1600’s had about 20 colors available, whereas artists today can choose from over a hundred. Vermeer used typically about ten colors in his palette. One difference in Vermeer’s palette from other painters of the 1600’s was his extensive use of natural ultramarine for his blue. 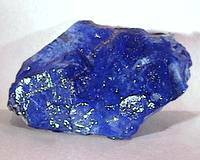 Ultramarine paint was made from an expensive semi-precious stone, lapis lazuli. Most artists didn’t use much ultramarine due to the cost, but Vermeer used the color not only for blue areas in his paintings but to shade white walls and drapery and for shadows. Using ultramarine alongside other colors gave Vermeer’s work a special glow. In Young Woman With a Water Pitcher, ultramarine was used not only for the tablecloth but also for the daylight through the window panes and some of the shading on the wall. Other examples of ultramarine are in The Milkmaid and Woman in Blue Reading a Letter. There has always been a lot of debate about Vermeer’s painting techniques in the art world due to their almost photorealistic details. Such perspective, depth, and detail were not present in other paintings of that long-ago period of the 1600’s. Many art historians have decided that Vermeer made use of a tool called a camera obscura. The camera obscura is a simple device which uses a lens and a viewing screen at opposite ends of a darkened chamber or box. It is basically a photographic camera without the film. Real cameras were not yet invented in the 1600’s. Tim Jenison, an American modern-day inventor who has a computer graphics company, became curious about whether it was true that Vermeer used a camera obscura. He set out to duplicate the techniques Vermeer might have used for the painting, The Music Lesson. Tim experimented with lenses, recreated the room depicted in The Music Lesson, and even made his own paint by grinding as was done in the 1600’s of Vermeer’s day. A documentary movie was made about Tim Jennison’s experiment called Tim’s Vermeer. He concludes that Vermeer did make use of technology for his paintings. Whether Vermeer did or not does not take away from his genius as a painter. Vermeer is one of the most highly regarded Dutch artists of all time, although that was not always the case. Vermeer was moderately successful in his hometown of Delft, but an invasion of the Netherlands by France hurt the economy and affected him. Vermeer died suddenly at the age of 43 of what is thought to be a stroke and left his family in debt. Afterwards, for more than 200 years Vermeer was overlooked by nearly all of the art world. Only after 1866, when a French critic rediscovered him, did Vermeer's works become widely known. He is now recognized for his technical talents, his ability to bring interest to everyday moments, and his skill at rendering light. Vermeer’s works hang in prominent museums all around the world. Chasing Vermeer by Blue Balliett is a fun mystery. Watch the book trailer below.